Zelda and I are in full hibernation mode on the weekends now that temps have dropped. She’s really embracing the holidays (she slept underneath the Christmas tree last weekend), so I’ve been finding ways to perpetuate her holiday joy. As we were watching Christmas movies on Sunday, I really started craving hot chocolate and found myself wishing I could make a large batch to drink throughout the day. That’s when this whole Crock Pot Hot Chocolate thing hit me (the Crock Pot really is my BFF in the winter), and I began my search. I found a few recipes online and ultimately ended up tweaking them to make my own, and the result was pretty delicious! This is definitely going to find its way into my Saturday morning routine. What’s your best Crock Pot creation? Tell us in the comments below (we are super pumped about our new comments layout, be sure to check it out!). Set the Crock Pot to low and whisk together the milk, condensed milk and chopped Baker's chocolate. Once combined, whisk in the cocoa powder, vanilla extract, peppermint extract and salt. Cover and allow to cook for 2 hours, stirring a few times every 30 minutes or so. 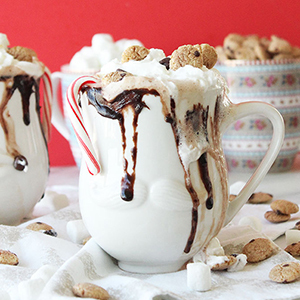 Spread the chocolate frosting on the rim of the mug, pour in the hot cocoa and top with whipped cream, cookie crisp, crushed candy canes and marshmallows.